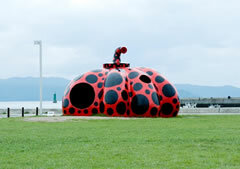 This is an art facility created by artist Shinro Ohtake where visitors are actually able to take a bath. 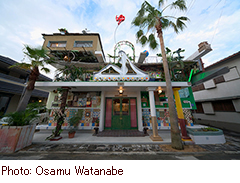 “I love YU” was created to provide a place for Naoshima residents to rejuvenate as well as a venue for exchanges between Japanese and international visitors and locals to take place. The exterior and fittings of the bathhouse, from the bath itself to the pictures decorating the walls, the mosaics, and even the toilet fittings, reflect the world of Shinro Ohtake. 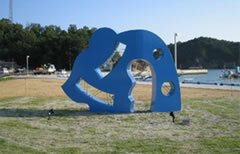 The bathhouse is operated by the Naoshima-Town Tourism Association. Mondays ※Open on Mondays for national holidays but closed the next day. Information about Artist is here. Original products are available for purchase at the front counter. 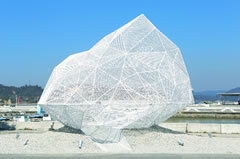 Opened in summer 2013, Miyanoura Gallery 6 is located in the Miyanoura District on Naoshima Island. 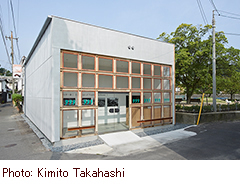 Architect Taira Nishizawa has transformed “Pachinko 999 (Three Nine),” a former amusement arcade enjoyed by residents of the island, along with an adjoining park, into a new space where visitors and local people can get together and relax. Information about Architect is here.